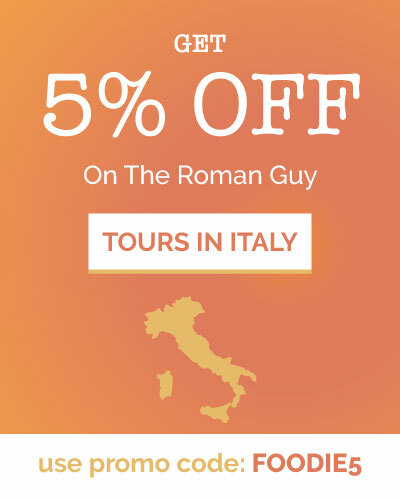 Italian summer: a time where Italians escape the heat of the city and head to the sea or mountains for its cooler air! A season change also means we get to relish in summer’s delicious vegetables and fruits! 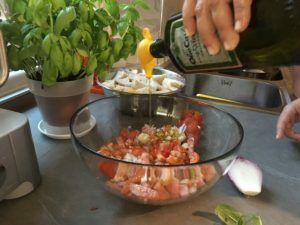 Here are a few of my absolute favorite Summer Italian recipes! 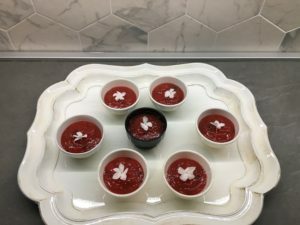 La Parmigiana! This dish screams summer to me. 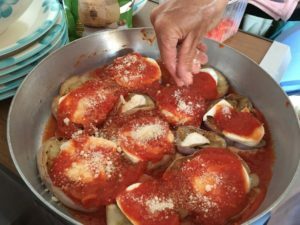 Eggplants are a summer vegetable and the first glimpse I get of them at the supermarket fill me with a need to make this heavenly dish from Sicily. 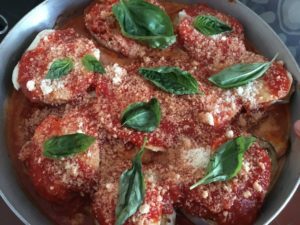 There’s different versions of how to make Parmigiana, however, the tastiest is when you fry the eggplant. There’s no meat in Parmigiana, however, its a filling dish for a dinner due to the heaviness of the cheeses. 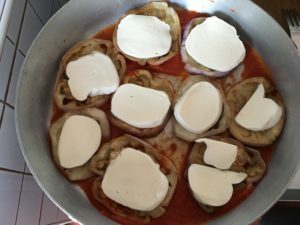 The mixture of the fried eggplant with the sweetness of the tomato sauce topped with gooey melted mozzarella is a dish to savor in! 1.Gently wash and towel dry the eggplant. Slice the eggplant horizontally about 1/4 inches thick. Place the slices on a flat surface, sprinkle with salt, set aside for 30 minutes to rest. 2. 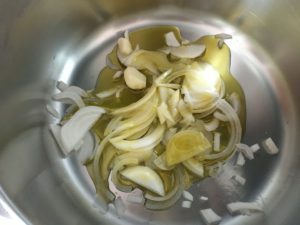 In a medium sized saucepan, add in garlic, chopped onion and olive oil. Cook until soft and light golden brown. 3. Add in the tomato sauce, bring to a boil, stirring often. Bring down to a simmer for around 30 minutes. 4. 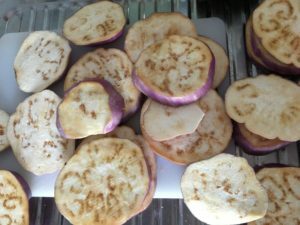 Once the eggplant slices have rested for 30 minutes, pat dry with a paper towel to absorb any excess water. Fry in olive oil until golden brown. 5. 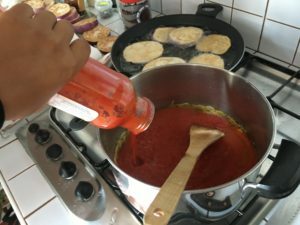 In a baking sheet, add a ladle or two of the tomato sauce you’ve prepared to the bottom of the pan. 6. 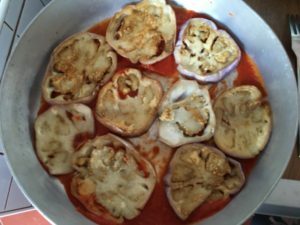 Place fried eggplants in a single layer on top of the tomato sauce. 7. 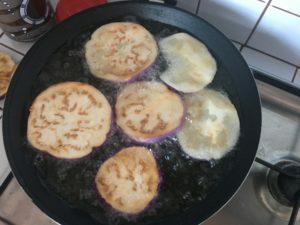 On top of the fried eggplant add in slices of mozzarella onto each piece. 8. 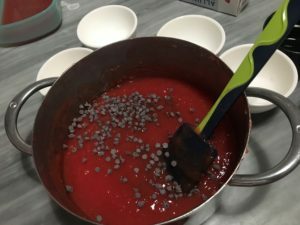 On top of the Mozzarella, add more tomato sauce and then sprinkle with grated Parmigiano Reggiano. 9. Repeat the layering process until all ingredients have been used. Once done, top with basil leaves, bake for 15 – 20 minutes until golden brown. 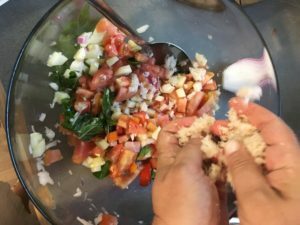 By far the easiest and fastest preparation goes to Panzanella! 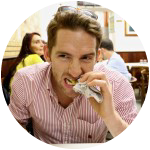 I remember sitting in a tiny restaurant in Sansepolcro in Tuscany when my boyfriend ordered this dish. At first glance, it looked utterly disgusting and something I would have never ordered. However, after some convincing from his part, I grabbed my fork and took a hesitant bite. To my complete surprise it was delicious! I would have assumed that the texture would have bothered me but the flavors of all the ingredients blended so well. This easy to make recipe is the perfect summer afternoon lunch! 1. 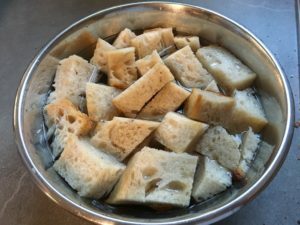 Collect stale bread, cut off the edges and cut into little cubes. 2. Soak the bread in water. 3. Wash and dry tomatoes, cucumber, onion and basil. Chop into bite sized pieces. 4. Once all vegetables have been chopped, drizzle with olive oil and add salt. 5. 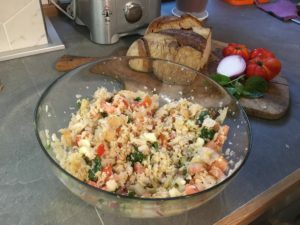 Squeeze the water out of the bread, place over the mixing bowl with vegetables and crumble it on top. 6. 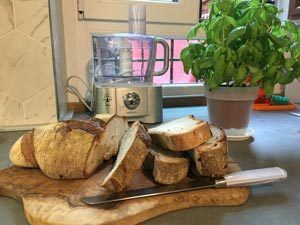 Once all bread has been crumbled, stir gently all ingredients, taste to see if more olive oil and salt needs to be added. Enjoy! Earlier this summer while visiting my adopted Sicilian family, there happened to be an abundance of fresh watermelon. In order to make sure it didn’t all go to waste, the mom surprised me in making this delicious treat! It’s the perfect Summer dessert after a day out in the heat. I had never heard of this dessert. 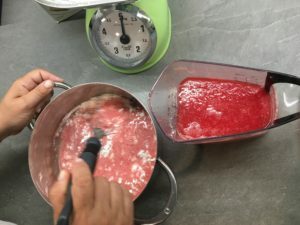 It hails from Palermo, Sicily and is usually made in August when the abundance of watermelon is overwhelming. The toppings vary from cinnamon to Jasmine flowers. Be creative! 1. 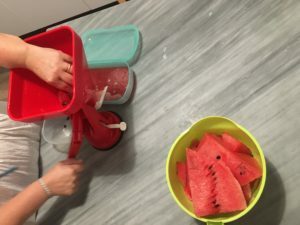 Cut watermelon into pieces, squeeze to obtain its juice. 2. Stir in cornstarch and sugar while the juice is cold. Whisk until there’s no lumps. 3. 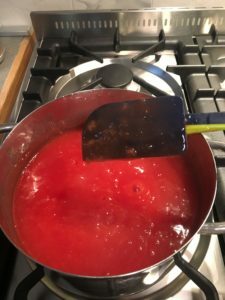 In a small saucepan, put on low heat until it simmers and becomes a jelly – like consistency. 4. Leave to cool. Once cooled, add in chocolate chips to resemble watermelon seeds. 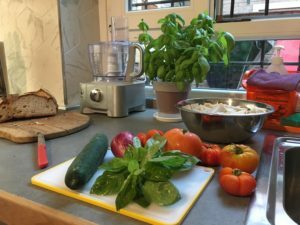 If you enjoyed this post, check out our Sicilian Pesto Recipe! Share your favorite Summer recipes with us on Facebook, Instagram or Twitter!